I always wanted to create a protoplanetary disk in Universe Sandbox (Dan, don't forget it, please), however given the limitations of the program in this point I had to improvise. Did I create a planet with close orbit of its star, for this I did use the data of the exoplanet TrES-3 (http://exoplanet.eu/star.php?st=TrES-3) and I put turn it rings of 2-3 radius and 3-5 radius, I gave 8 clicks in each option button to generate an expressive amount of particles. Then I put the simulation to run and, as it had imagined, the rings were quickly disrupted by the gravitational force of the star and their particles were dispersed around the star forming something similar to a protoplanetary disk. After about 5 years the disk homogenized but before this it was already possible if observe some interesting aspects of the models of planetary accretion, as the gap that the planet creates when attracting material along its orbit. Another interesting aspect was the dynamics for the which the planet attracts material, causing the matter spiral of the two borders (interns and extern) of the disks to it. Something that I found onlooker was that many of the particles didn't collide with the planet but it were transferred of the internal disk for the external disk after its encounter with the planet. In other words (that is interesting because analyses of the probe Deep Impact indicated that the material of the comet Tempel 1 was formed close to the Sun what is strange for a comet that expected would have formed of material of areas of the cloud of Oort, maybe in the period of formation of our solar system this matter transfer has been expressive allowing that material that was close to the sun came to be ejected in orbits well more external), the planet became a bridge for the which matter was transferred among the two disks. After 15 years of simulation that we see that the planet TrES-3 cleaned its orbit increasing the space among the internal border and external of the disks that surround it, a lot besides Hill's Radii (before the flaw maid's space had the almost exactly the diameter of its Hill Radii). 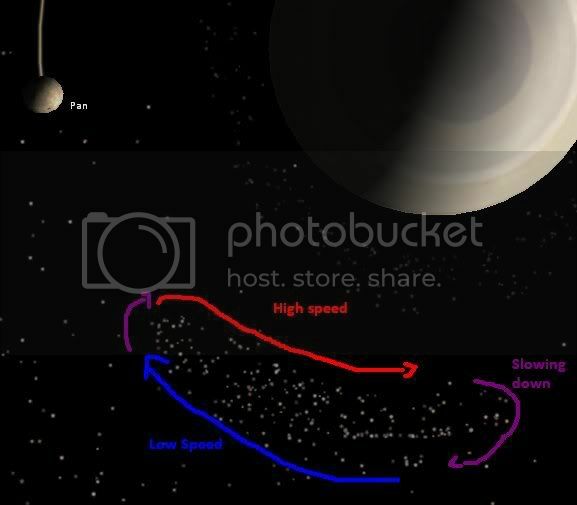 The planet Eos, due to its low mass, just caused a very subtle gap, however the planet Hades created a great gap and very quickly, even the distance that it found (what also coincides with the models of planetary formation: gaseous giants planets are formed much more quickly than planets like the Earth). However the most interesting on Hades was the creation of two groups of asteroids positioned in the Lagrangians Points L4 and L5, corresponding to the Trojans asteroids of Jupiter ! 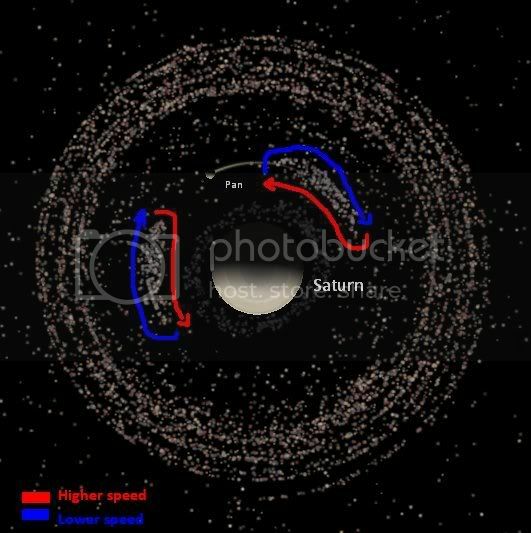 Besides the Planet created an interesting distortion in the internal disk creating two loops of particles opposite in the disk, possible corresponding to particles in resonance with the planet. The planet TrES-3 created in the internal disk a similar configuration to the asteroids of the family Hilda ! I dream that in the future Dan Dixon will give a present for us with a easy way of creating planetary disks , with some option of choosing ( freely ) the amount of particles, its mass, and individual identification (names) and orbital caracteristics so that we can accompany their behaviors and migration. is the rings orbiting the sun ? However the most interesting on Hades was the creation of two groups of asteroids positioned in the Lagrangians Points L4 and L5, corresponding to the Trojans asteroids of Jupiter ! T hat is so neat, I HAVE to try that. Those animations are really cool. I think you'll like the next update. It will give you basic controls to create these discs from the XML files. What do you mean by "individual identification (names) and orbital caracteristics so that we can accompany their behaviors and migration." You want to be able to give them names like planets? And by orbital characteristics you mean what exactly? Also... What program are you using to create the animated gifs? Cool Dan, really thanks ! I´m anxious for this update ! Something like Gravity Simulator, there we can give names for every particle, we only define the initial name than the software identify the rest of particles automaticly ( for exemaple, we generate a simulation and create a group of particles with the name "P", than the software identify the other particles how P1, P2, P3,...Pn, being n the number of particles set to be generated automatically). Giving names to the particles we can follow the path of some particle or group of particles ( in Gravity Simulator the innermost particles of the disk have the lowest numbers, raising toward the outermost particles ). A think that to have freedom to create any disk configuration we need some way to define the basic orbital elements of the initial conditions of the disk, mainly ( until only ! ) inclination and the excentricity. Another important aspect are the density of the disk cause define the number of the particles in the disk is not sufficient to simulate realistically planetary formation and the behavior of the particles of the disk, indeed the interactions of the planesimals and planets with the "viscosity" ( in really the gravitational resistence offered by the particles to the displacement of the planet or planetesimal ) of the disk, the viscosity plays a important hole in planetary formation cause it can drag the angular momentum of the planet doing it migrate to close to the star ( this is the origin of the Hot Jupiters with small SMA ). To define the density of the disk is only necessary a way of the user insert the number of particles in the disk and the minimum and maximum SMA of the disk. The animations are not with the full quality ( have some strange "dot lines" ) to reduce the dimensions of the final file. But I can define much better quality if needed. Dan, I understand that maybe I have specified many features that would be ideal for configuration of the protoplanetary disk, but I also know that in the moment this software is just one among their projects and I imagine the work that gives to accomplish improvements for the new upgrades. It was only suggestion and not some kind of "pressure" although I see that the features that I mentioned are interdependent. But I trust in your creativity and ability as programmer as much as in your knowledge on celestial mechanics. If it's possible to implement the mentioned points it would be great, otherwise we will work over the solution that you found. can you post an XML file off the initial system please? This file is only with TrES-3 planet. I've opened the System "Saturn and moons"
Here another screen that explain what i said.. It is intresting that near the surface of Saturn another ring was formed (the dark one): it has 2 deformations: one between L3 and L4 (the bottom one), and one next to L3. This 2 deformations follow Pan as L3, 4, and 5. I made one but it seems that it is clearing out an area outside of it's orbit not on its orbit. Why is this happening? Going on with simulation, the gravity of the star and of the planet will pull away the major part of the asteroids on the orbit and will remain just the trojan asteroids, or nothing.. 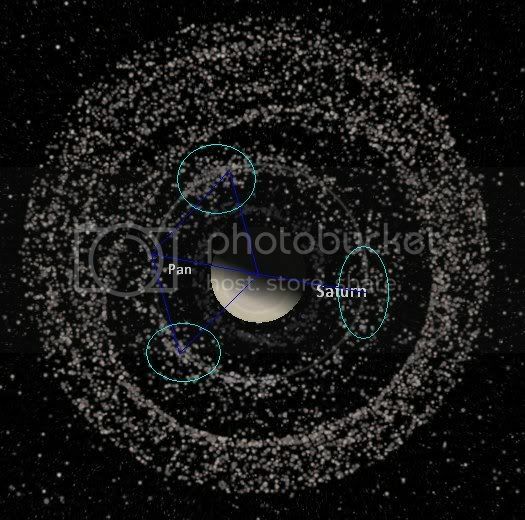 Playing with the trojan asteroids i noticed this: why are they scattered and not focused around the Lagrange point? You have to whatch it... Just run the Tres-3 system and wait untill you see the groups of asteroids and then whatch them. P.s. I don't know, but probably the speed of each asteroid doesn't change very much, but it's just compared to the orbit where the asteroid is, that it become "high" or "low"
IT's probably because of the lagarange point, it is like a 3 D horseshoe ish thing and it is like gravity is more powerful there so they get stuck. http://orbitsimulator/ and click Download and run a sim with about 50 objects on the orbit of, say, Jupiter. They put it in rotating frame (View > Rotating Frame) and Adjust it to Jupiter (View>Rotating Frame adjustment) and in the down menu click Jupiter. L1, L2, & L3 are like the point on the top of a beach ball. If you place a marble on the ball it will stay for a moment until it gets slightly off center and will then roll off. These points are unstable. L4 & L5 are like the point in the bottom of a bowl. If you put a marble in the bowl it will roll around, but will always come back to the center point. I read wiki but Still confused. Anyone care to explain...in a more simple way? lol. The Beach Ball and Bowl helped a little but not really. the lagrange points are points of "equilibrium". If you put an object in that position, it will remain in orbit because the force that pull it out of the system is perfectly balanced by the gravity of the 2 objects. Now, L1, L2, and L3 are very instable: if the object is a nanometer (or less) away from the right position it will go away, sooner or later. Ahh! Now I see! Thanks alot for explaining FGFG!